Hello! What a week it’s been here… the week of the annual T-family birthday treble (more on that later) but suffice to say, I’m shattered! Today, I hope to keep my waffle to a minimum and get stuck in, but… I do want to say that it’s been a struggle to find 7 items I *love* simply because we’re getting to that funny time of year in the shops. 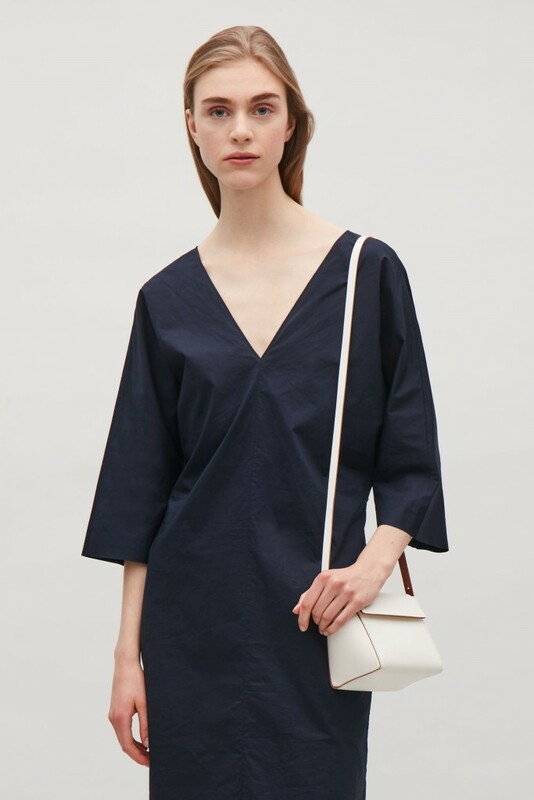 You know – the one where Spring /Summer stock has been in for a few months now, and yet, for the most part, Spring/Summer hasn’t shown it’s face? It’s why I don’t love “high summer” in terms of fashion. Rather, it’s not the clothing I dislike, it’s that we can’t wear the clothing here, in our British summertime… which is basically crap. Aaaaaand… already, some of the sales have started. Not proper-proper sales, but just the beginnings of reductions… which is no bad thing of course, but I’m a little bored of it all. Bored of the weather – we’ve had pretty much 11 days straight of damp-squid-ness for June so far. The weather is a massive factor for most of us when we’re picking out what to wear, right? Anyhow, I’ll stop my #weatherwhinging now and apologise for doing so as I am actually boring myself with it! Perhaps it’s the vibrant colour of the jacket, or the poppers or the simplicity of the shape… I’m not sure, but when I saw this jacket I was most definitely drawn to it. Now I’ve never really bought from Cos before… accessories yes, but not clothing. I’m fairly certain the size 34 would be a little big across the shoulder /armhole on puny little me (if their sister store & Other Stories sizing is anything to go by… ) but if you are a larger size 6/small 8, then it would be fine. So, it’s not for the faint-hearted, I grant you that. 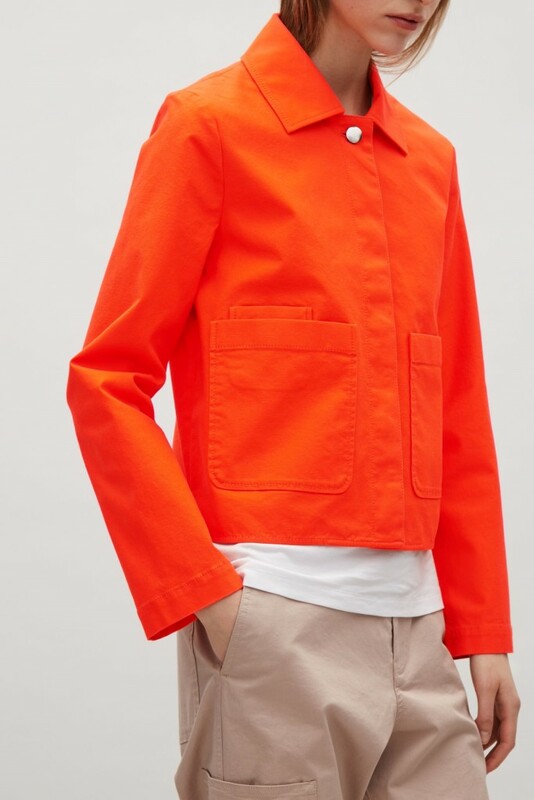 But if you fancy brightening up your day with a pop of zingy orangey-red… then this jacket could be just the thing? I’m going to be in London in a week or so – might just have to try this one. What can I tell you? I know it’s all about the basket bag right now, but this cross-body or shoulder bucket bag is a bit of a classic, isn’t it? Again, it’s simple lines, and classic colour-way really appeal to me. 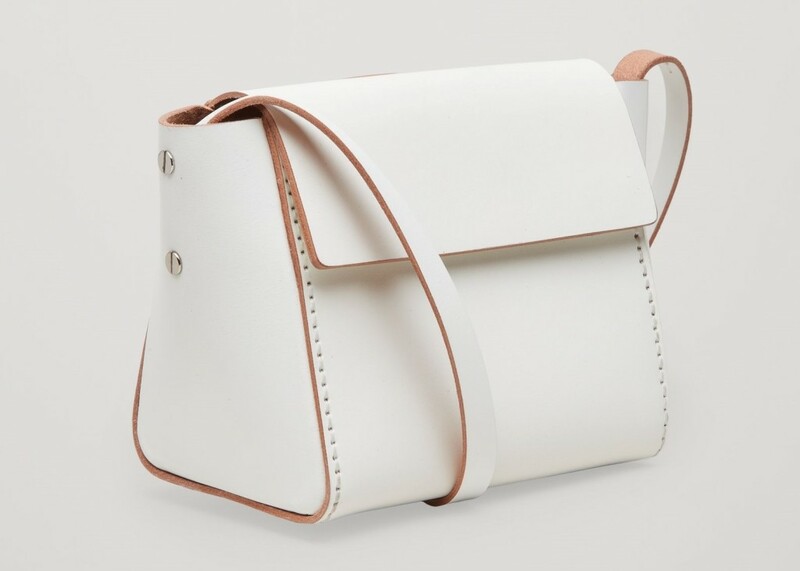 It’s the sort of bag I’d have sported as student (though no doubt, a crappy cheaper version) but right now, I’m thinking it would be a great size for carrying around my wristlet (with all my important wallet/keys/phone in), plus camera. And because it’s Jaeger, I can well believe that the bag is beautifully constructed and built to last. If canvas isn’t your thing, they have several mid-size leather shoulder totes down to £99 at the moment; and these are ‘petite’ totes so if you are a little minnie (like me) the bags are exactly the right size… worth investing in if you have the cash. Cute striped top with trumpet sleeve detail. 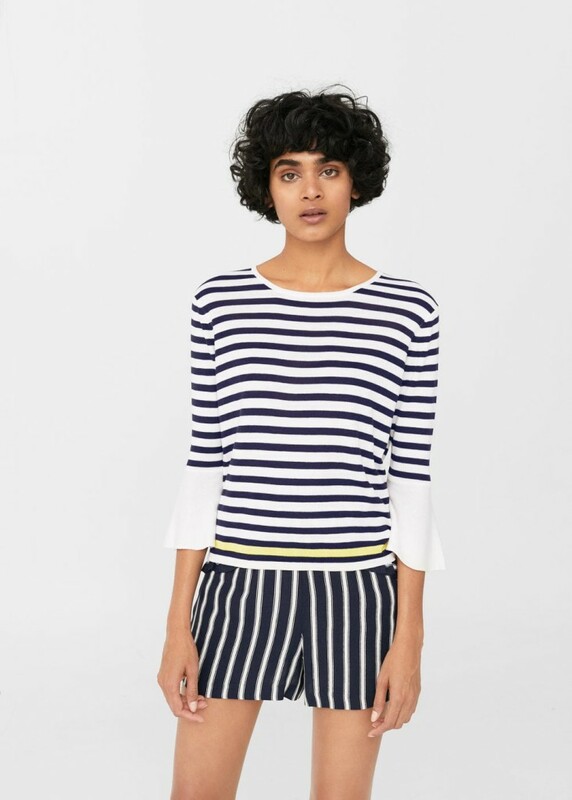 You can never have enough stripes in my view… and given that our summer is simply refusing to show its face, this would be a really useful top for those windy, not warm, but not cold kind of days we’ve been having a lot of recently. Though I have to say I prefer the red. 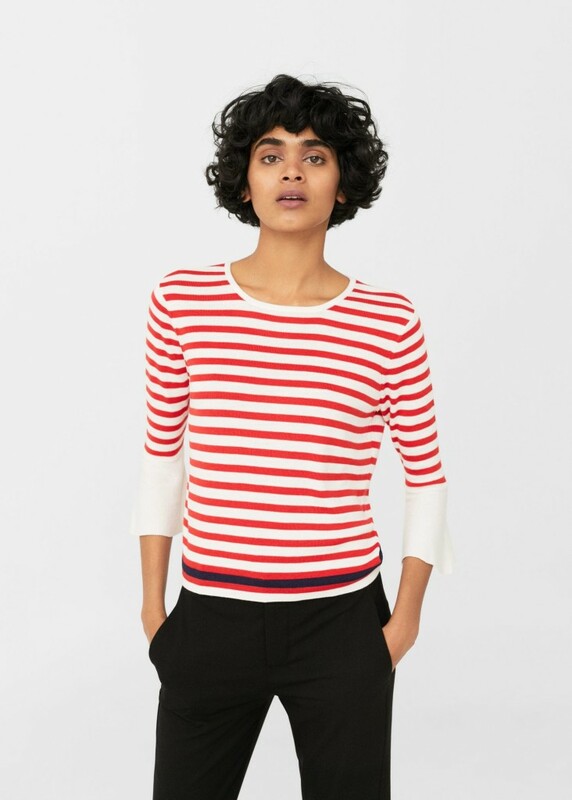 Unfortunately, Mango have this habit of not having everything available in all sizes: this top is available in Small, Medium and Large; so it’s not one I can buy because there is no XS. However, some of their clothing is available in XS, and then other clothing is available in size 8+ and a few things in size 6+. I find it extremely frustrating because more often than not, the things which catch my eye are not available in size 6 and XS. Anyhow I can’t deny… it’s a cute top! 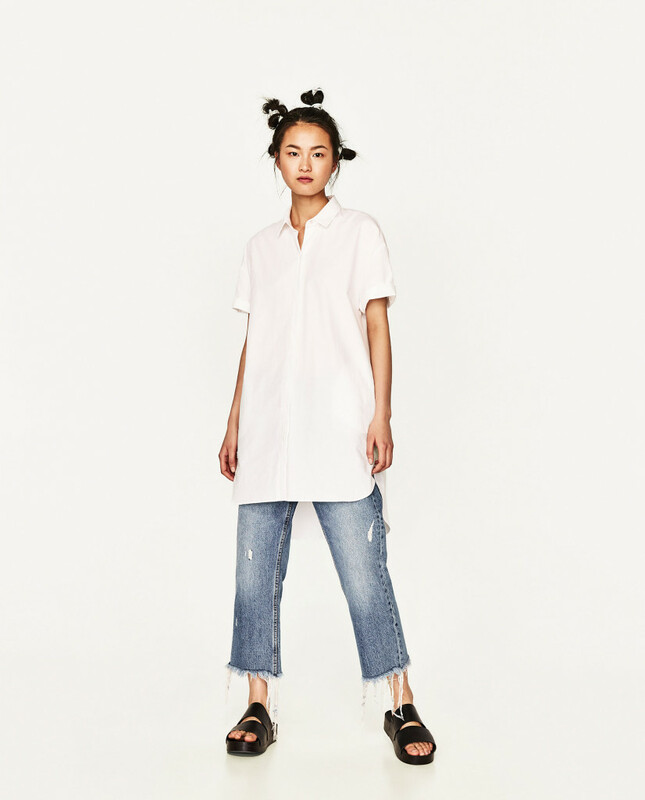 I like the idea of this long shirt, worn over jeans, maybe tie an obi belt around the waist, or you could keep it half unbuttoned? In fact, you could wear it open over a tee… and it could work as a shirt dress on my fellow shorties perhaps… and if not, a perfect poolside/beachside cover-up? I specifically chose this side shot to show that for the very reasonable £19.99 price tag, you even get pockets! This one *is* in my basket. My favourite style of bag is a flap-over bag like this one. And white leather is a perfect neutral for the milder months… it can in fact, work in the cooler months on dark coats & clothing as well. 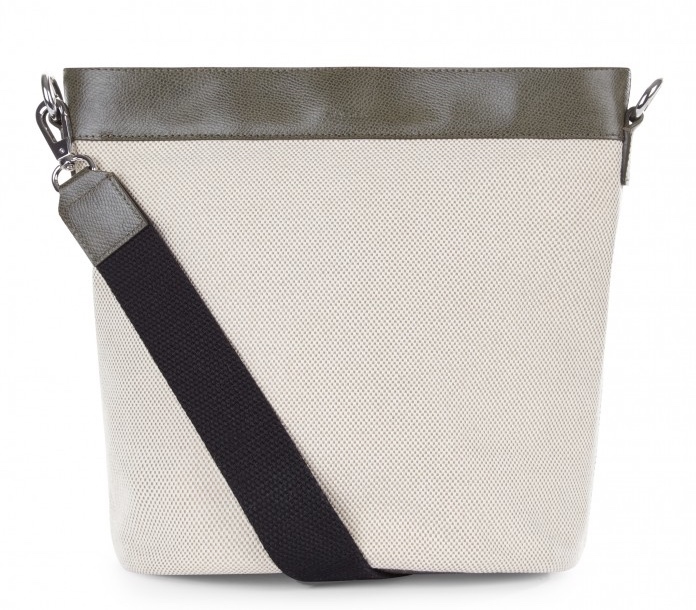 I have had this little bag in and out of my basket so many times I’ve lost count… but what’s stopped me from ordering it is the strap: it’s not adjustable which unfortunately means that the bag would be dingle-dangling round my knees! Well ok, probably not my knees, but it wouldn’t be great for me. The strap is however, fully detachable… though that’s not particularly helpful for me and how I would want to use it. I’ve missed the boat on this one because the smaller sizes are sold out online. However… it’s HM, so I’m fairly certain it would still be available in-store. It looks pretty yellow to me, but is described as orange… I love it and am rather regretting not buying it when I had the chance. I think what stopped me is that I’m having my ‘colours’ done soon with a stylist (an Instagram competition I won back in December) so I’ve been laying off buying ‘too much colour’; although I think I know what suits me, I’m keen to find out exactly which shades within each colour are best for me. 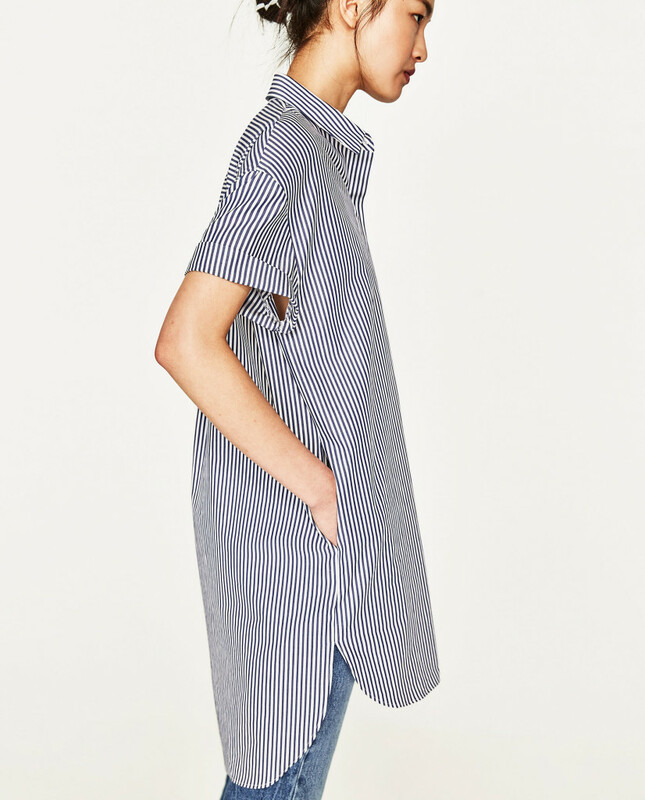 Anyway, back to the dress – it would be long on us shorties, but a simple hem to take up…? When I’m in London next week I’m going to see if I can track one of these down because of course, my small town HM didn’t stock it in the first place. 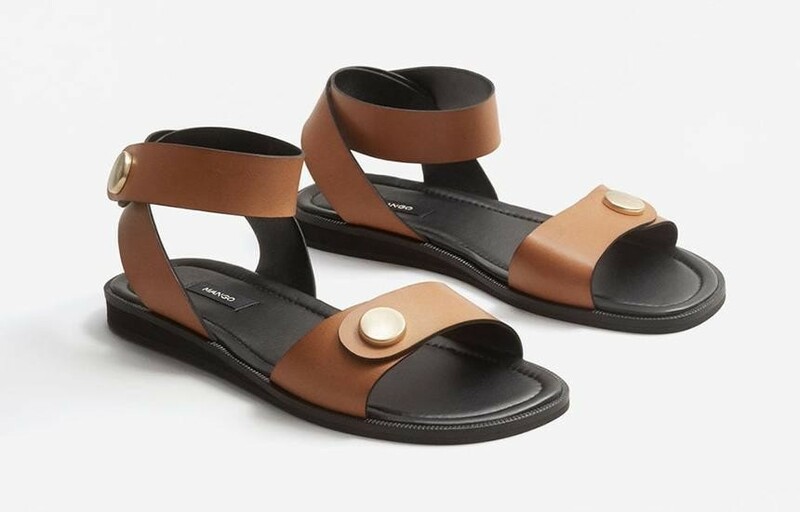 And number one for me this week has to go to these lovely tan Mango sandals. I bought these as a birthday treat for myself and can report back that they are super comfy. The actual colour is a fraction paler than in this pic, and I was really crest fallen when I first put them on because the ankle strap stood away from my ankles by quite a bit; however, once I stood up – the strap was exactly right. I have standard /narrow-ish feet and would say that these aren’t going to be brilliant for anyone with wider feet; the front strap stud (or popper) doesn’t open, it’s just a decorative thing. These were as close to the Stella McCartney popper sandals from my Birthday Dream (on) list a couple of weeks ago. Apologies – it’s not the best pic of the sandals, but quite honestly, I’ve struggled to find any opportunity to wear them given our Autumnal-Summer. I really can’t wait to wear them more, so hopefully, some better (i.e. sunnier) photo ops will arise soon. So, those are the 7 this week: anything take your fancy? 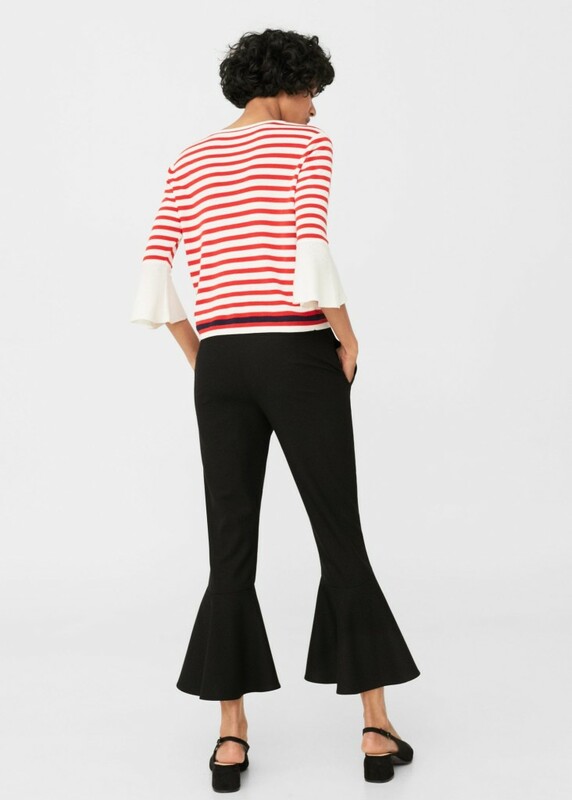 I love culottes, but I don’t love these. I haven’t seen them in the flesh, so perhaps I’m wrong here, but there’s a lot of lace out there which is really cheap looking (in a fire hazard kind of way) and so these just don’t appeal to me because of that . How about you? 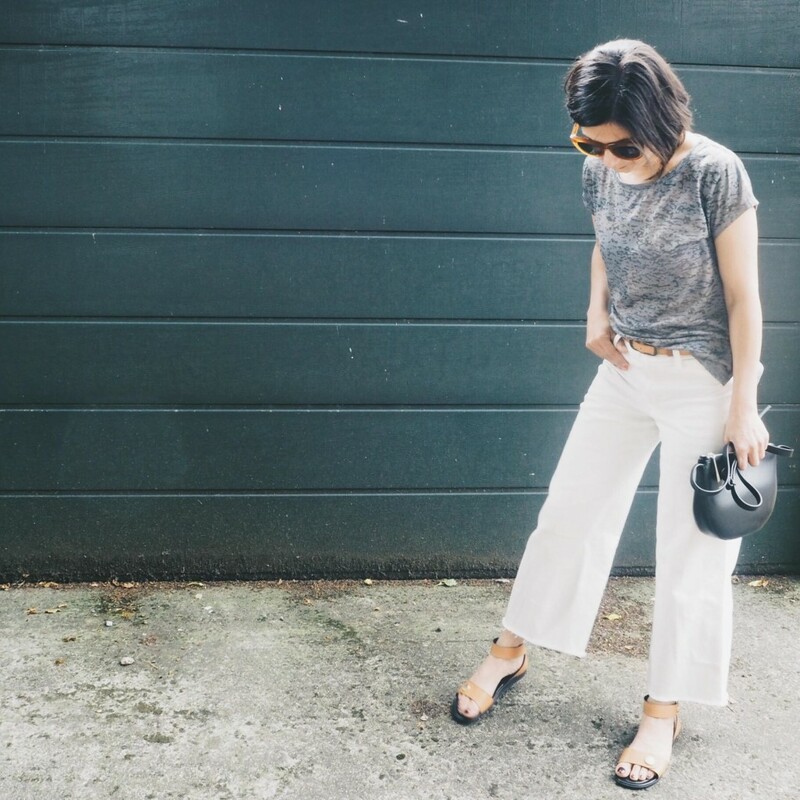 Would you wear lace trousers? It’s a bold colour, with big statement sleeves, but ultimately it’s quite a simple dress really. Look 1- It’s back to 1999: Wear the dress over your trousers! These Next Mid-blue Front Seam Cropped Jeans (£24.99) are prefect for wearing under a dress; these lovely Next Gold Weave Mules (£35) and this Warehouse Straw Basket Tote (£25) would complete your look. 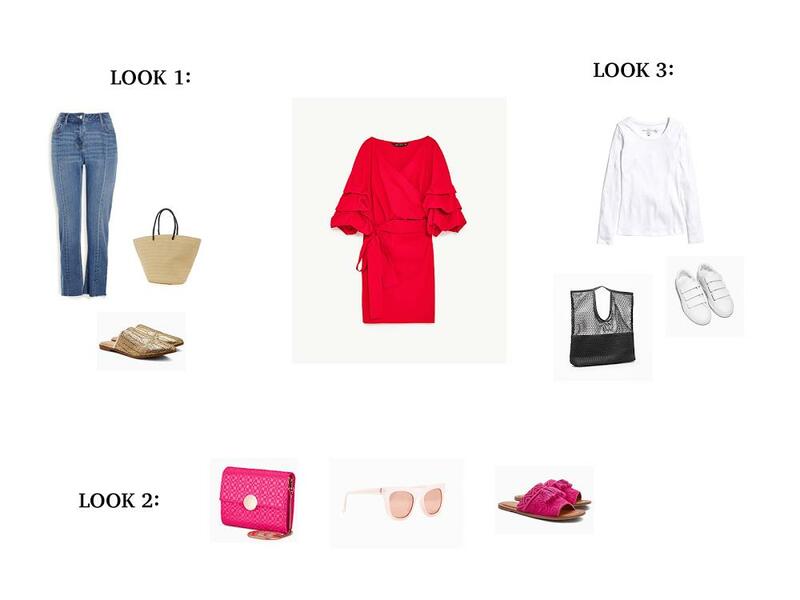 Look 2 – It’s Clash of the brights: Not quite colour blocking, but clashing the red dress with some of these Next Pink Tassel Mules (£45) and this bright pink Next Weave Across Body Bag (£24) would be a great holiday evening look, though I’d soften the shade of pink for sunnies a little with something like these Zara Sunglasses in Soft Tones (£15.99). 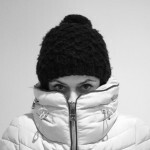 In terms of jackets… those puff-ruffle sleeves are tricky, eh? I’d go for a longer-line light-weight coat perhaps? Suggestions on a postcard, gratefully received! And there we have it: what do you think of the red dress: too bold and bright? Or just up your street? As ever, would love to hear your thoughts – leave a comment if you like. Postscript: I almost forgot! I mentioned at the beginning of the post that we’ve had a busy week – 3 birthdays in our Threads family all this week; and in fact, as my birthday comes first, I find I end up running around getting bits done for both Mr T and Little Magpie’s shared birthday and with it being the first week back to school after half term, I’m afraid I got caught out with my time management and simply couldn’t fit my mid-week blog in. Sorry! I know you guys don’t mind really, but I don’t like to say I’m going to publish something and then not do it. I hope to get that underwear post published this week – which will no doubt turn out to be a big fat anticlimax after I’ve kept you waiting this long! Anyway, sorry! !